Trane, a leading global provider of indoor solutions and services and a brand of Ingersoll Rand, presented its Energy Efficiency Leader Award to Belmont University at an awards ceremony held in the R. Milton and Denice Johnson Center on campus today. Dave Regnery, president of Heating, Ventilation, and Air Conditioning Commercial for North America, Europe, Middle East and Africa at Ingersoll Rand, presented the award to Steve Lasley, vice president for finance and operations. Each year, Trane recognizes organizations demonstrating an outstanding commitment to implementing best practices in energy efficiency and sustainability. Belmont was selected as the first of just two recipients to be recognized in 2016. 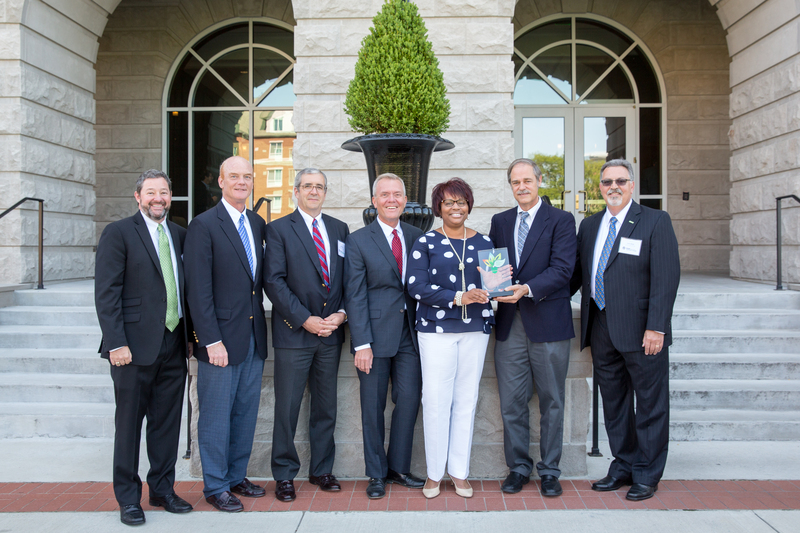 Trane is recognizing Belmont for best practices in energy efficiency and sustainability across campus. With enrollment more than doubling in 15 years, Belmont has grown from a 1.5-million-square-foot campus to a 50-building, 4-million-square-foot campus. Leaders undertook energy efficient and sustainable design and improvements that held energy cost increases to just 10 percent despite such a large increase in square footage. These upgrades represent a larger, long-term commitment to sustainability that reflects the university’s commitment to environmental stewardship. in individual buildings or campus-wide, from most personal computers, tablets and smart phones. The following organizations collaborated with the university on the recent campus expansion: Chaseco, LLC, served as the owner representative; Nashville-based ESa served as the architectural firm; I.C. Thomasson served as the consulting engineering firm; R.C. Mathews Contractor provided general contracting; Lee Company provided mechanical contracting and Enterprise Solutions provided electrical contracting. • The McAfee Concert Hall uses an ice thermal storage system to produce ice at night, when it is more efficient and energy rates are less expensive, generating 30 percent energy savings for the hall. • A geothermal heating and cooling system under the R. Milton and Denice Johnson Center uses the earth’s natural temperature to regulate interior climate. • The university boasts two LEED buildings: Janet Ayers Academic Center is certified LEED Platinum, the first university in Tennessee and the first LEED for New Construction project in Nashville to achieve that level, and the Randall and Sadie Baskin Center is certified LEED Gold. • An innovative and interactive irrigation system collects run-off rainwater in underground tanks and utilizes current weather data to dictate the need for water. • Educational and sustainable green roofs provide learning labs for students, while serving the environment through better building insulation.